All seven games of the Calder Cup Finals will be on a TV screen near you. Below are broadcast details. Note that the AHL made AHL Live free for the Finals last year. We'll see if they do that again to assist on Game 1 (and 4) that are tape-delayed on NHL Network. The American Hockey League announced today that broadcasts of all seven games of the 2018 Calder Cup Finals between the Toronto Marlies and the Texas Stars will be televised across Canada on TSN2 and in the United States on NHL Network. Leafs Nation Network, which will produce the broadcasts, will also air the series for its viewers in Ontario. The Eastern Conference champion Marlies, top development affiliate of the National Hockey League’s Toronto Maple Leafs, finished with the best record in the AHL during the regular season and carry a nine-game winning streak into the Finals after eliminating Utica (3-2), Syracuse (4-0) and Lehigh Valley (4-0). They are vying for their first championship. The Western Conference champion Stars, top affiliate of the Dallas Stars, are in the Finals for the third time in their nine-year history and are looking to duplicate their 2014 title. Texas defeated Ontario (3-1), Tucson (4-1) and Rockford (4-2) to reach the championship round. 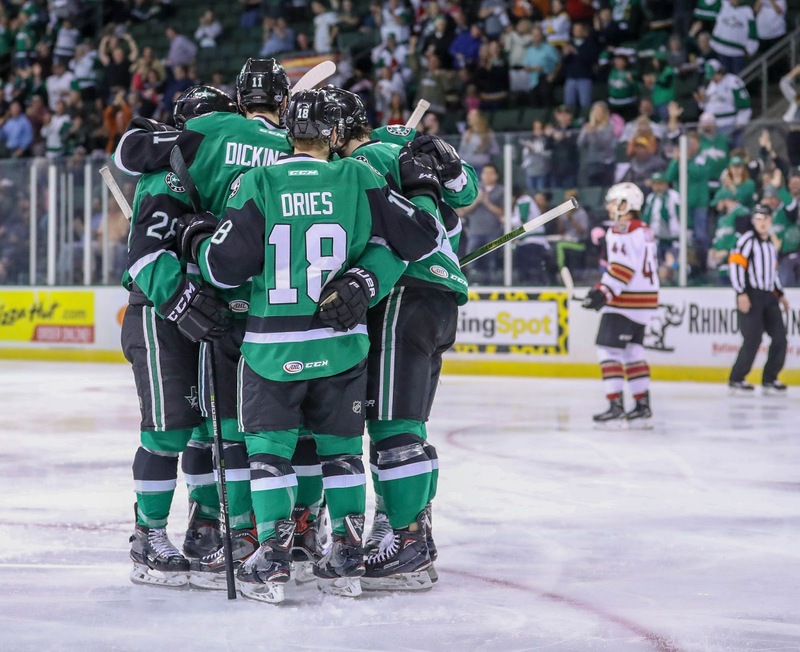 The Texas Stars are loose and ready to head to Toronto for Games 1 and 2 of the Calder Cup Final series. The Marlies are a strong competitor, and Texas is well aware of their potency. "We know they’re a good hockey club. We’re just going to play the brand of hockey we know how to play," said head coach Derek Laxdal. "This group is a resilient group, a tight-knit group. We have a deep group that plays hard. When they’re down, they don’t quit. When they’re up, they don’t quit. If we’re down or up, lose or win, they’re going to respond the same way." In addition to the strong team on the ice, Texas is readying itself for the media frenzy that accompanies anything associated with the Maple Leafs. "I think it’s awesome we’re playing in a huge hockey market. Our guys will enjoy it. I’m looking forward to it as a coach. It’s exciting to get back to the Canadian market, have the odd Tim Horton’s after the game. I told the guys to have fun and embrace it." Texas hasn't played Toronto in several years since the Marlies headed over to the Eastern Conference. Coach Laxdal has some experience from the Memorial Cup in playing a team in the championship that you haven't seen all season. "At the pro level, it’s a little bit different than junior. Most teams play the same, systems are the same. You’ll find they might have more speed than you see watching tape. That first period is huge. Same as the Memorial Cup, it’s all about that first period." Travis Morin agrees about that first period, "You watch as much video as you can. That first period will be a feeler out period. At this point, you have to keep playing your game. You can’t make any big changes. You just need to shut them down where possible." Morin also reflected on the Texas Stars's previous trips to the Cup Final, comparing and contrasting: "Every time it’s different. The first year, we were defensive oriented and then we got Jamie Benn for the playoff run and he was obviously a big contributor for us. The second time when we won, we had a good team all year long and we knew we were good. We were fast and quick and teams wore down against us. It was still a battle. This year, we didn’t have the best regular season but we started clicking [in the playoffs]. We’ve never been blown out of games, and we don’t blow other guys out. It’s a battle to the end." Those battles to the end have delivered 37 overtime games over regular season and the playoffs. Coach Laxdal joked that he was getting gray hair with all the OT, but continued, "I’ve been on a lot of championship teams but I’ve never seen a team like this. We don’t get rattled. We probably played our best hockey of the game [in OT in Game 6]." "As a coach, you learn to take a deep breath and let the players decide. You make your adjustments, but they don’t need me yelling at them from behind the bench. I’ve never seen it before in all my playing and coaching days." 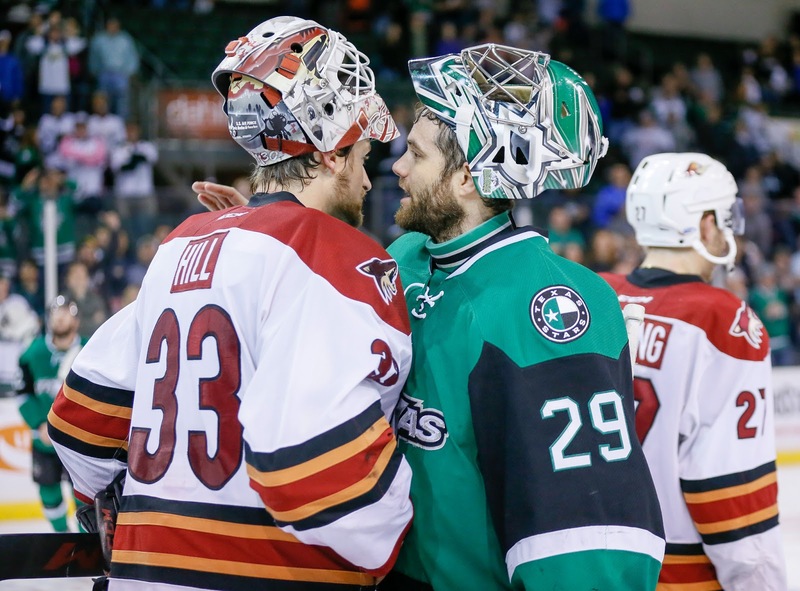 Despite heading to the hockey hotbed of Toronto, Mike McKenna is confident Texas fans will hold their own at the H-E-B Center. "It’s going to be no different [in Toronto] from most cities when you get to this level. I’ll put our fanbase and H-E-B Center up against any arena in this league. Our fans are as passionate as anyone. We drive into the games, and we see them playing street hockey, tailgating and doing it the Texas way. We love that, and we feed off that." Texas meets Toronto at Ricoh Coliseum for Game 1 on Saturday at 3 PM Central. 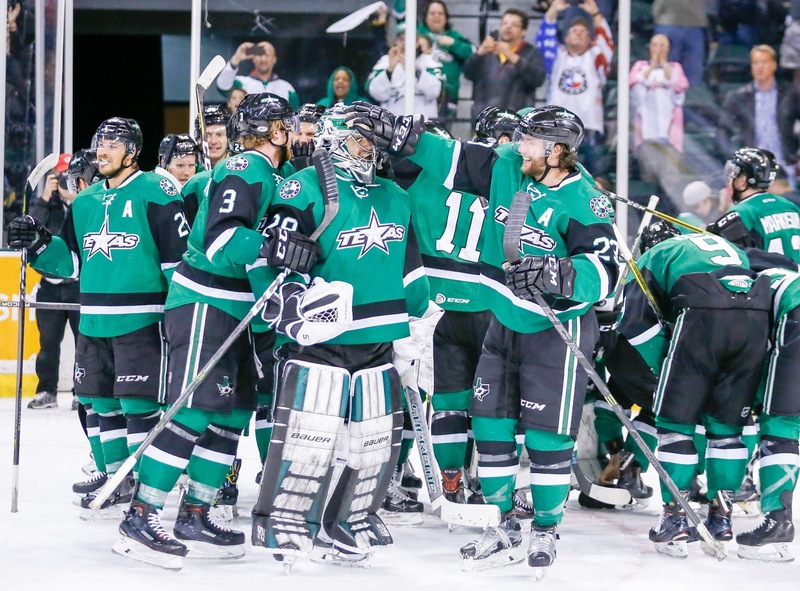 For the third time in team history, Texas heads to the Calder Cup Finals. Below is the schedule for the final round. All times are Central. 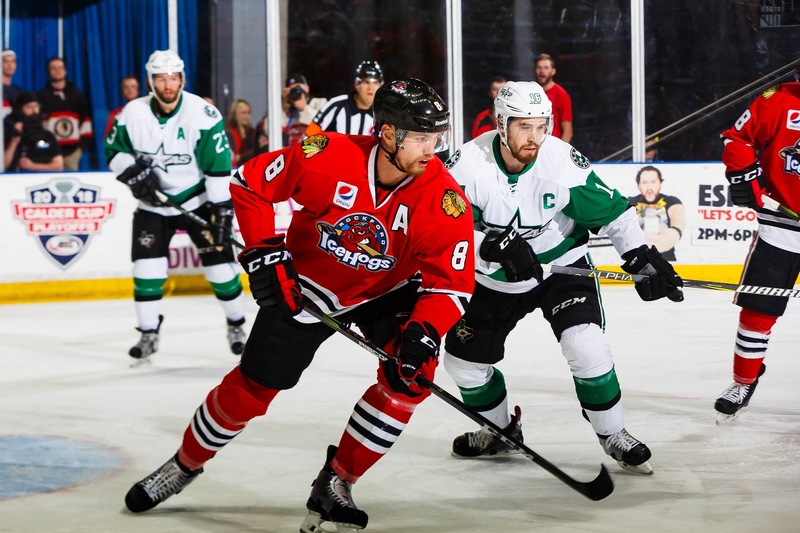 The Rockford IceHogs defeated the Texas Stars 3-1 on Friday, ensuring they wouldn't leave town with the Richard Clarke Trophy and forcing a game 6. The Stars trailed for the majority of the game and often failed to clear their zone against the relentless IceHogs forecheck. Veteran goaltender Jeff Glass was once again a huge factor and turned in 40 saves on 41 shots. Mike McKenna struggled a bit in net and had an uncharacteristic play late in the third period that saw the IceHogs push the lead to two. Roope Hintz scored the single tally for the Stars. The first period seemed like an eternity for the Stars and couldn't have ended soon enough. As has been the case for the past three game, the IceHogs opened the scoring. It only took three minutes of play for the IceHogs to pin the Stars in the their own zone and cycle the puck. Cody Franson capped the possession with a goal from the blue line. The Stars suffered a defensive breakdown five minutes later, and Luke Johnson pushed the Rockford lead to two. Left unmarked streaking toward the crease, he quickly finished a cross ice feed from Victor Ejdsell. David Kampf's hard shot mercifully rang off the post in the closing minutes of the frame. 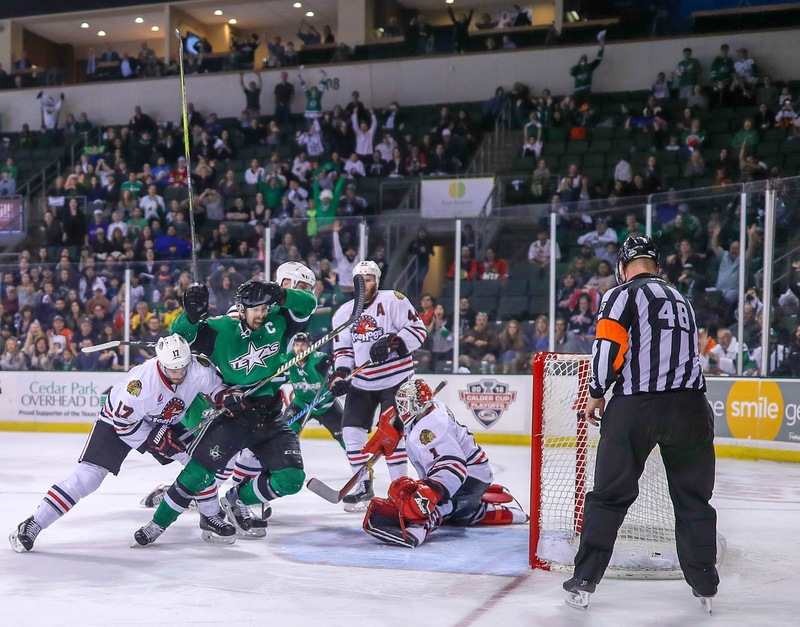 A goal there would have given the IceHogs an insurmountable lead with the way the Stars were playing. Curtis McKenzie even dropped the gloves with Cody Franson before first intermission to try and inject some life into his group. The IceHogs held onto the puck for the first several minutes of the second period but generated little. The Stars earned their first power play opportunity, but the Rockford forecheck was as aggressive as ever and they held they controlled play while shorthanded. After nine and a half minutes, the Stars finally got the push they wanted. They forced a turnover in the offensive zone and Hintz cleaned up Joel L'Esperances initial shot on goal, trimming the deficit to one. The ice slowly started to tilt towards the Stars as they outshot the IceHogs 14-6 in the frame. Less than three minutes into the final period, Justin Dowling's breakaway backhand shot deflected off the post. The Stars generated a few good looks from that point, but Glass was better in the crease. To make matters more difficult, McKenna gave up the softest goal of his spectacular postseason run. With just over eight minutes left in regulation, Kampf threw a harmless dump in from the blue line near the Rockford bench, and it deflected off of McKenna's blocker, high into the air and into the net. The Stars had one more power play in the closing minutes of the game and emptied their net. Glass, who seemed to be more galvanized as the game went alone, continued his strong play and sealed the deal for his club. The series heads back to Cedar Park for game 6 on Monday. The puck drops at 7:00 PM CDT. The Richard Clarke Trophy remains at the ready in Rockford but just beyond the reach of the Texas Stars. Not that they'd touch it, anyway. They held a 2-1 lead in the waning minutes of game 4 but couldn't quite get the job done as Luke Johnson's late period tally sent the game to overtime. Victor Ejdsell's second goal of the night came on the power play during extended play to keep the IceHogs' season alive. Both teams made some interesting adjustments to their lineup that will bear watching in game 4. The Stars moved Denis Gurianov down to the fourth line with Austin Fyten manning the middle next to him. It's unclear if this was a demotion or an attempt to spread scoring potential throughout the lineup. Meanwhile, the IceHogs pulled the plug on Collin Delia in favor of Jeff Glass to mind the crease. It paid dividends with Glass making 28 saves on 30 shots. Keep an eye on the injury report for Stars defenseman Andrew Bodnarchuk. He took a puck to the face in the third period on Thursday but did return to the game. John Nyberg did return to the lineup after his injury and registered one shot on goal. The Stars have three more cracks at this thing with two potentially coming at home. Those are odds that you'll take any day. Game 5 could be the clincher in which we see the Stars ceremoniously hover around the Western Conference's richest reward. The puck drops at 7:00 PM CDT. The power play was lethal on both sides of the scoresheet tonight. Texas collected two power play goals but the ultimate game-winner came in overtime, yet again, on the power play from Rockford. 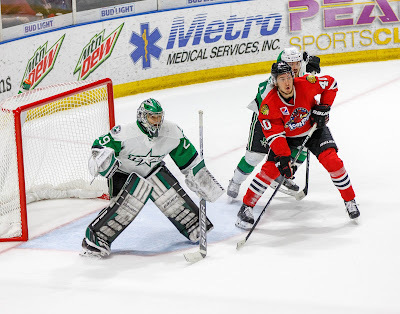 Victor Ejdsell had a two-goal night, opening and closing the scoring, and keeping Rockford alive for another night in the Western Conference Finals. The IceHogs opened the scoring in the game with a nice play by Victor Ejdsell. After a strange bounce at center, Ejdsell beat Andrew Bodnarchuk around the edge right to left to score his sixth of the postseason. Things got dicier for Texas as the Hogs had two posts in the early going and outshot the Stars 13-3 at one point. Penalty trouble for Rockford was a gift to Texas once again in this contest. Gustav Forsling hauled down the always quick Denis Gurianov to earn a tripping call and Viktor Svedberg got a cross-checking call to make it a 97 second long 5-on-3 for the visitors. Travis Morin had the two best chances on the power play and cashed in on the second. Jeff Glass sealed the post on the left-wing side on the first chance, but Morin snuck by Glass on the right side just a short while later. Morin walked it down and pulled the trigger with Glass going low and Morin beating him high. Texas extended its streak of games with at least one power play goal to six tonight. By the end of the period, Texas had closed the shots gap to 16-14 Rockford. Rockford was denied of a goal in the second period for the first time in the playoffs. The Stars would find twine on yet another power play opportunity late. A dagger of a goal coming off the stick of Matt Mangene at the point, his first goal of the playoffs. Mangene’s shot didn’t go in clean, as it deflected off Carl Dahlstrom and in with just 25.7 seconds left in the middle frame. Andrew Bodnarchuk had a scary moment early in the third period as a shot rode up his stick and got up under his visor. He went down hard and fast, clearly in pain, but did leave the ice under his own power. He would return to play after some repairs. Texas went into a shell in the third period, and it bit them. The Stars didn’t get their first shot of the period until 4:48 remaining in the frame. That didn’t come until Texas saw their lead evaporate with a tip in front by Luke Johnson that eluded Mike McKenna 13 minutes in. In overtime, Colin Markison headed to the box with a tripping minor and set up the ultimate game winner. Ejdsell was left all alone on the right wing side, and Matthew Highmore drew off the defenders and then dished to Ejdsell for the winner. Texas gets another crack at closing out the series tomorrow night in Rockford at 7 PM. UPDATE: Jeff Glass will make his postseason debut for the IceHogs tonight in net. Colin Delia allowed 6 goals on 27 shots on Tuesday and has lost three games in a row in net. The trophy is in the building. Hands up if you made that prediction at the start of the series. OK, you're all lying. 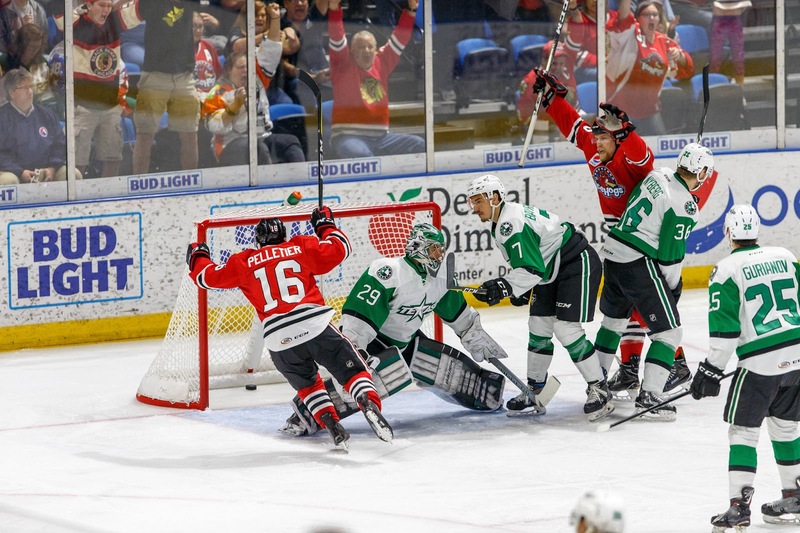 The Robert Clarke Trophy, the AHL's award for the Western Conference's playoff champs, will be in Rockford tonight as Texas has a chance to advance to their third Finals appearance in their nine year history tonight. It's a historic opportunity for the franchise and one that clearly demonstrates they have the potential to be a dominate force in the AHL every single year. Last game, the Stars got scoring from all over the lineup. When this team was inconsistent during the season, often the conversation postgame drifted to the top lines or the bottom lines not chipping in with offense. It never seemed like the entire team was all clicking at the same time. Until now, that is. Tuesday's game saw a pair of goals from Curtis McKenzie, the club's top-line winger, one from Justin Dowling,, McKenzie's linemate, a pair from Sheldon Dries, the solid third-line center, and a key marker from Austin Fyten, a fourth-liner who hadn't laced them up for game action in the entire playoffs until now. That combination is what put Texas over the top. When the Stars won the Cup in 2014, it was a similar story. Opponents could never relax. Line four had just a lethal of opportunities as line one. In the postseason, Texas has scored 39 goals so far and five of those have come from fourth liners. Indeed, two were game-winners in overtime and Fyten's was a key game-tying goal. When everything is clicking, you get magic. It doesn't hurt that the defense is activating well and Mike McKenna is playing some of the best hockey of his career. Final note: The Rockford IceHogs and Texas Stars have always seen their series end in sweeps. 4-0 for Texas in 2010, 3-0 for Rockford in 2015. The Texas Stars edged the Rockford IceHogs 6-5 in a thrilling overtime game, putting a stranglehold on the series with a 3-0 lead. 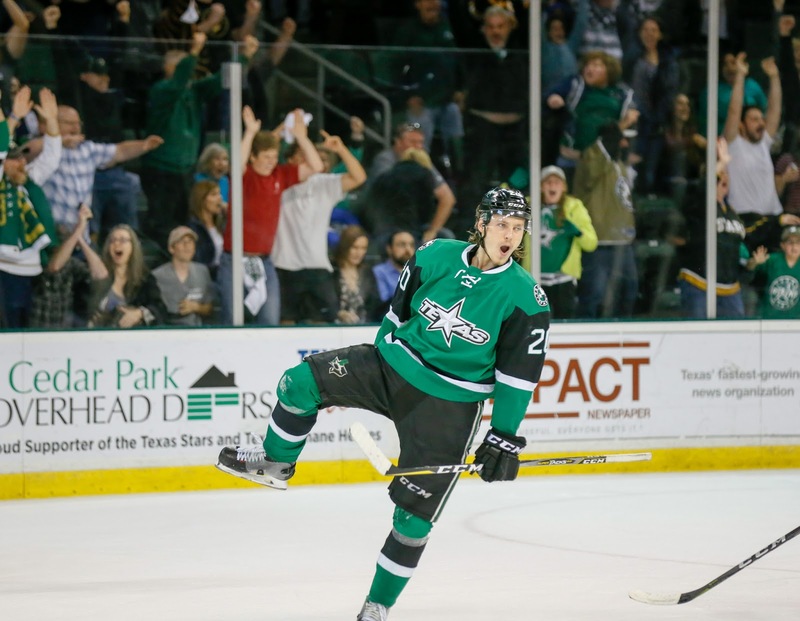 Stars captain Curtis McKenzie turned in a three point game and had the game winner. It was the seventh time in this postseason that the Stars have played in overtime. 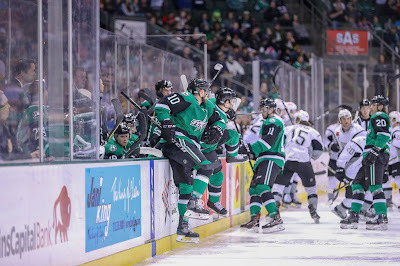 Austin Fyten, who was injured for the past fifteen games, drew into the lineup for the ailing Remi Elie and tallied a big goal late in the third period to give the Stars a momentary lead. Sheldon Dries, Justin Dowling, and Jason Dickinson all pitched in with two points a piece. Near the five minute marker of the first period, Tyler Sikura skated past Matt Mangene on the back check and went five hole on Mike McKenna. With thirteen and a half minutes to go in the period, the Stars earned ample time of 5-on-3 play and capitalized, tying the game at one on Curtis McKenzie's goal. McKenzie was left alone on Delia's front porch and cleaned up a loose puck near the crease. A few minutes later, the IceHogs hemmed the Stars in their zone and drew a penalty. On the delayed call, Rockford was able to get the extra attacker on the ice and took advantage with a goal from John Hayden. Dowling had his best shift of the postseason to even the score again with under seven minutes left in the first period. First, he couldn't net a glorious chance from the slot when a rebounded puck found his stick. When the Stars went on the rush the next possession, Dowling wasn't to be denied a second time and buried a beautiful short side roofer. Less than a minute later, Dickinson forced a turnover and found Dries streaking down the slot. The pass was on time, and Dries notched his fifth playoff goal. 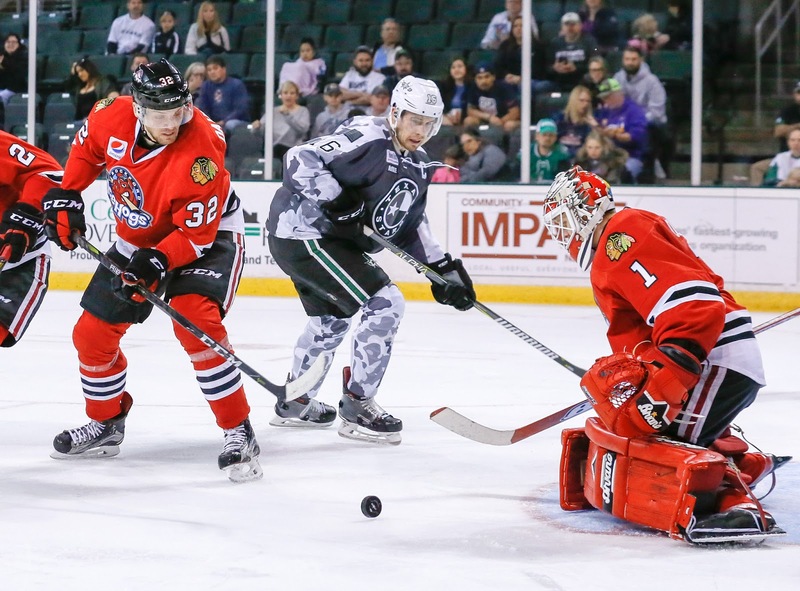 The IceHogs pushed back in a big way in the middle frame as they held the Stars scoreless and notched two tallies. Gustav Forsling tied the game from the high slot in the waning seconds of a man advantage just after six minutes of play. His one timer somehow baffled McKenna and beat him in the high corner. 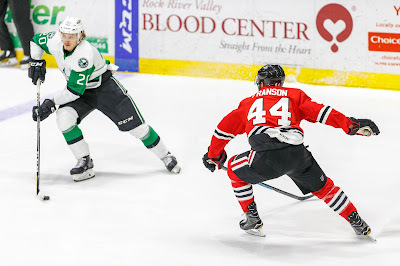 The Stars had a chance to get it back on the power play another six minutes later but squandered the opportunity as the IceHogs generated a couple of shorthanded looks. Just after liberating their man from the box, they set up a tip-in goal for Luke Johnson right in front of the crease. Winger Matthew Highmore had the primary assist on both second period goals. After fending off a blistering IceHogs forecheck for eleven minutes of the third period, the Stars countered as Dries scored his second goal and evened thing up at four with a slick backhand to forehand deke in front of the net. Fyten's goal gave the Stars the lead. With two minutes left of play and an empty IceHogs net, the Stars were forced to ice the puck three consecutive times. Cody Franson's prayer from the blue line crept in past a heavily screened McKenna to send the game to overtime. The Stars were the aggressors during extended play and looked like they had been there before. After coming up blank on some good chances from the fourth line, they clinched the game with McKenzie's second goal. On the rush, McKenzie threw a pass across the crease that bounced off of the back checking Adam Clendening and in past Delia. With a chance to sweep the series, the Stars will be back at it again Rockford on Thursday night. The puck drops at 7:00 PM CDT. 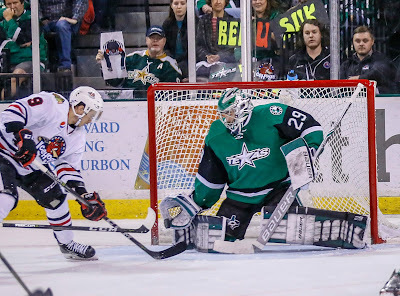 The Texas Stars will look to improve upon their 3-1 road record from this postseason when they take on the Rockford IceHogs in game 3 on Tuesday night. Team playoff history tilts in their favor, with the Stars only losing one series out of four when they were up two games to none. Coming off their overtime thriller on Sunday that saw them score two power play goals, the Stars have a real chance to put the clamps down. Every indication from the locker room is that the players know what's at stake in every game, and they have yet to let arrogance or pomp creep into their game this postseason. 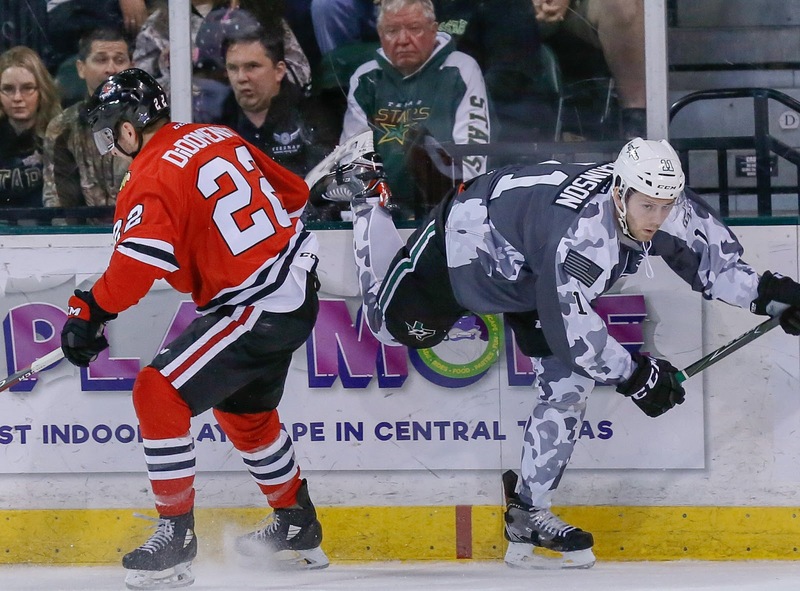 The IceHogs remain the most dangerous opponent the Stars have taken on in these playoffs, after all. Chris DiDomenico has goals in both games against the Stars and still clings to the lead in postseason scoring with 14 points. His teammate, defenseman Adam Clendening, is on DiDomenico's heels with 12 points, giving the IceHogs a blistering power play unit. The Stars would do well to mind their sticks while their in Rockford. The five power play opportunities they ceded to the IceHogs in game 2 was probably too many, though they did get seven chances themselves. Where the goal scoring will come from the Stars is hard to predict, and they like it that way. On Sunday, it was Curtis McKenzie with the game winner in overtime, but he was quick to point out that everyone has pitched in on scoring during extended play this postseason. 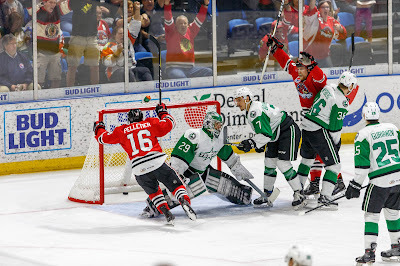 With the Stars icing three dangerous scoring lines, the IceHogs will have plenty to deal with if they want to make this a series on Tuesday night. 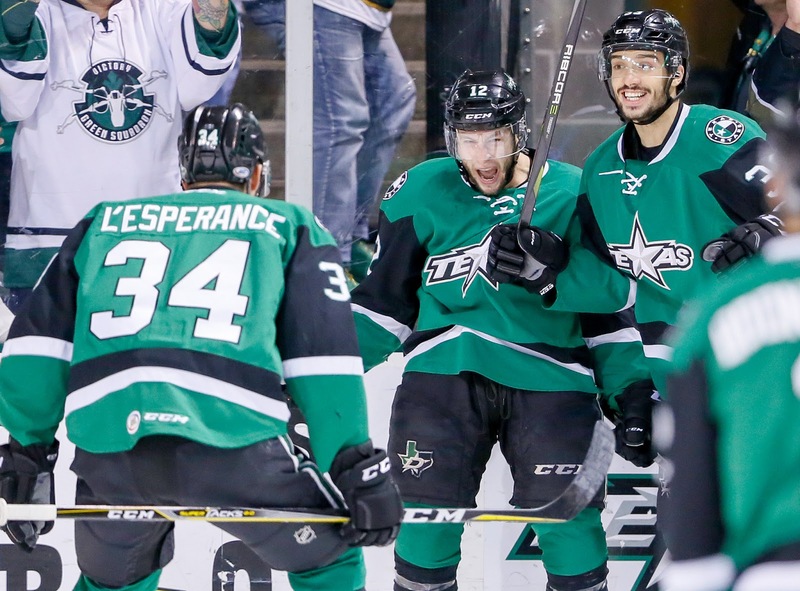 The unexpected ride continues for the Texas Stars in Game 2. 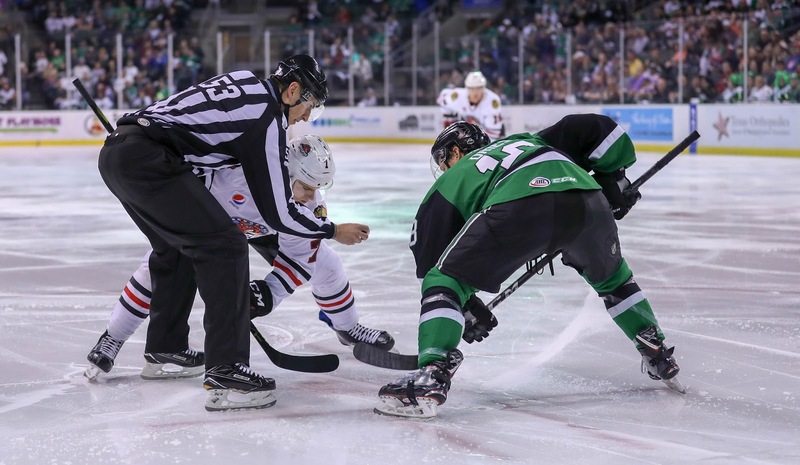 After handing the Rockford IceHogs their first defeat of the postseason, the Stars can guarantee another game in Cedar Park this postseason with a win tonight. 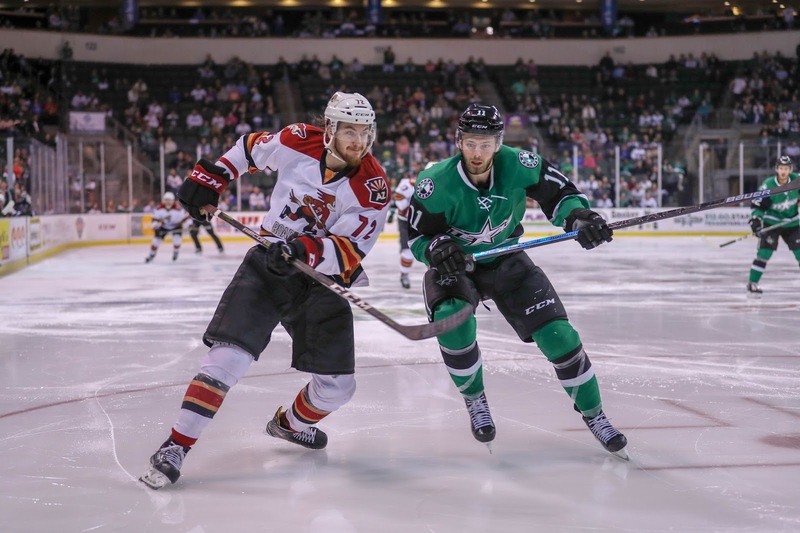 "They’re going to come with a great push on Sunday, and we have to be ready to rise to the challenge," said Texas Stars head coach Derek Laxdal. Even with scoring first on Friday, the Stars were still in a situation where they felt unsettled to start the game. "We had about a week off," said Jason Dickinson. "We’re starting to get our feet under us, so we can just keep getting better every game. We don’t expect to have anymore starts like that." Watch to see if the 5 PM routine shift changes anything with the start of the game. Hockey players are creatures of routine and a 5 PM start is an oddity in the world of hockey. Texas did not have morning skate today, for example. 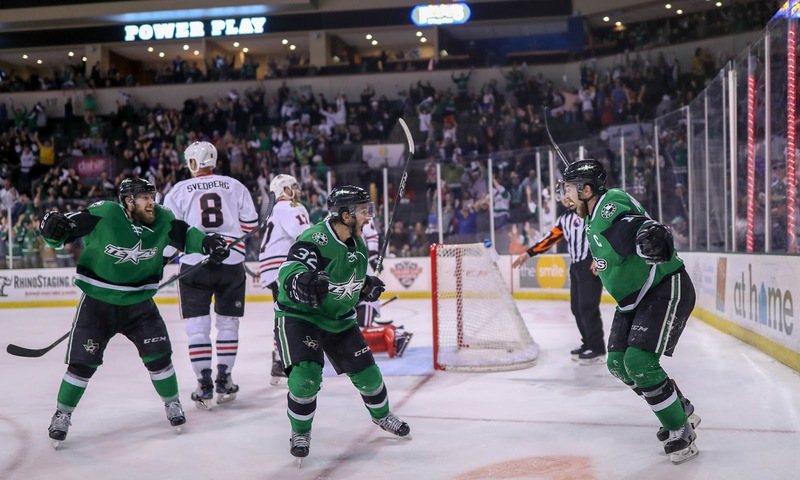 The Texas Stars knocked off the Rockford IceHogs 4-2 on Friday night, winning game one of the Western Conference Finals and saddling Rockford with their first loss of the postseason. Roope Hintz and Remi Elie both ended the game with two points each. Sheldon Dries had one goal, and Jason Dickinson played a strong two-way game. To Dickinson, getting to the net and getting dirty goals was the recipe for success for the Stars. The Stars crashed the net hard less than five minutes into the game and were rewarded with the opening goal. Dillon Heatherington’s shot from the point somehow stayed out while Delia was heavily screened, but Curtis McKenzie cleaned up the the rebound with some yeoman’s work to make it 1-0. Over the next several minutes, the IceHogs put on a quick clinic of postseason special teams play. A power play for the Stars at six minutes into the game went nowhere with the IceHogs controlling play for the duration of the penalty. The IceHogs were then the recipients of one full minute of 5-on-3 time when Curtis McKenzie committed a tripping penalty while he was on the kill. Reece Scarlett had a sliding block to deny a shot on a yawning net and keep the Stars up by one momentarily. However, the blistering IceHogs power play wouldn’t be denied as Carl Dahlstrom was left unchecked at the right circle for a one timer that trickled in under McKenna. Both teams finished the game 1-for-4 on the power play. McKenna’s marvelous glove save at point blank on Luke Johnson with five minutes left in the period kept the Stars in the lead through the end of the frame. He put together another stellar outing with 31 saves on 33 shots. It wasn’t long into the middle frame before the IceHogs tied again, when DiDomenico picked up his goal at the four and half minute marker. A blocked shot bounced in Rockford’s favor, and DiDomenico took advantage of the open net. Texas bent but didn’t break and was rewarded. Elie’s power play goal pushed the Stars back ahead near the eleven minute marker when he shoveled the puck in through a pile of humanity near Delia’s crease. “Remi looked engaged tonight,” said Laxdal. The Stars held the lead but were outshot 28-16 heading into second intermission. 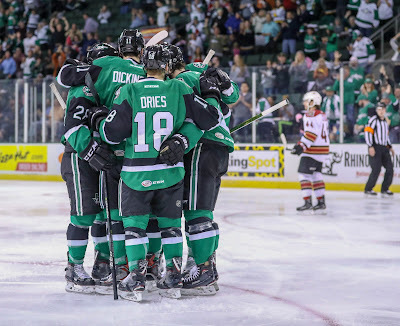 Dries’s goal near the thirteen minute marker gave the Stars a two-goal lead that they would not relinquish. Jason Dickinson screened on the play, and Dries made the most of Elie’s clean zone entry pass. 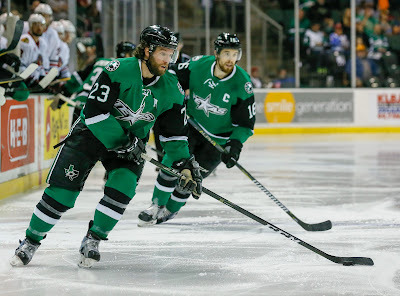 The Stars take on the IceHogs for Game 2 on Sunday at 5 PM Central. So begins the Western Conference finals between the Texas Stars and the Rockford IceHogs. With home ice advantage in this 2-3-2 format, the Stars know they almost have to make a statement in game one. That's easier said than done. The Rockford special teams have been well documented by Texas coaching staff and players. 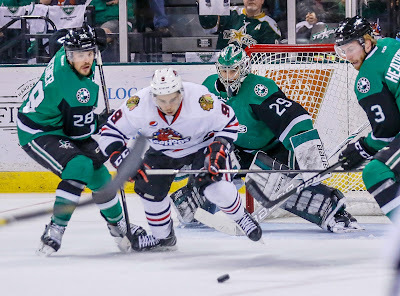 The Stars simply cannot afford to take needless penalties in the first game with the IceHogs' power play unit humming at 38%, good for 15 goals in the playoffs. Mike McKenna must maintain his strong play and be the best penalty killer when things break down. Coach Derek Laxdal also anticipates a heavy forecheck, much like the Tucson Roadrunners, and a grinding pursuit of the puck from the IceHogs. Expect to see McKenna have to come out of the crease quite a bit to play the puck and try to slow down the quick forwards of Rockford. He spoke about this on Tuesday's Media Day. "It depends on how they’re dumping the puck. Some teams are better than others with it. Some teams will go a period where you handle it a lot and then they realize they should put it in the corner. I’m sure we’ll find out what to expect in that first game. We’ll have a plan of attack for it when it comes." The Stars also won't be looking for only the top players to carry the scoring load in game one. As Brian Flynn noted on Media Day, depth scoring will tilt the balance of winning or losing. "We’re going to need everyone," he said. "It’s not a line or a guy. We’ve been getting scoring throughout the lineup. Our fourth line kind of won us that last game [against Tucson]. That’s what we’re going to need to win." For the IceHogs, center Chris DiDomenico currently outpaces all postseason players in scoring with eleven points. With home ice on the front end of the series, it will be intriguing to see which line Laxdal deploys against DiDomenico's top line. With rookie goaltender Collin Delia playing as good as any goaltender left in the playoffs (.948 SP), every decision and strategic move will have an indelible impact with the stakes so high. Laxdal doesn't expect to have to go to anyone who is currently out of the lineup and plans to stick with the group he iced against Tucson. "If something happens and we feel we need to make a change, if we feel we need something, then we will," he said. "If we have an injury or a sickness. But right now we’ll go with the group that has got us this far." 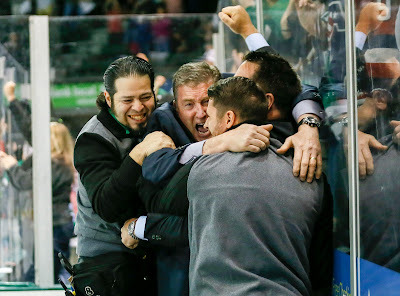 The mood of the Texas Stars on the ice during Tuesday's morning skate could accurately be described as business casual. 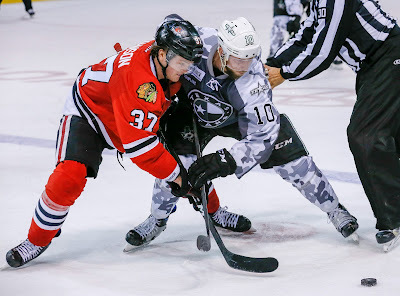 As they look ahead to Friday's game one against the Rockford IceHogs at home, the team is having fun and itching to get back to competing on the ice with such a long layoff between rounds two and three. Coach Derek Laxdal, Brian Flynn, and Mike McKenna all spoke to the media on Tuesday after practice to discuss the upcoming series. Rockford forward Chris DiDomenico leads postseason scoring with 11 points. Here are some interesting takeaways. 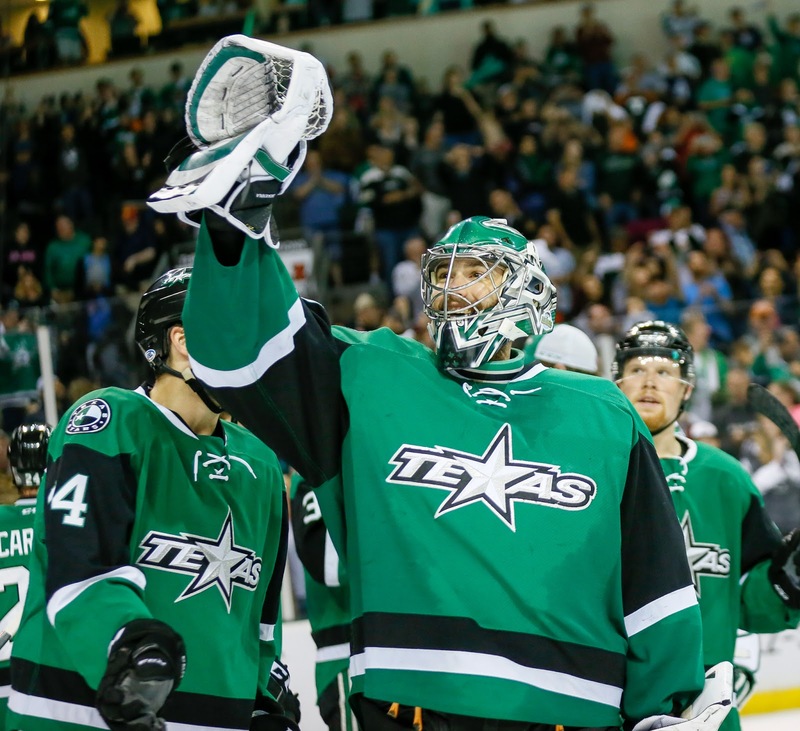 Inarguably, the Stars' spectacular postseason run so far has been anchored by McKenna's stellar play in net (.952 SP). "When we’re not playing that well Mike has bailed us out," said Flynn. "Having a hot goalie at this time of year is just as important [as playing your best hockey]." Not to be overlooked is McKenna's demeanor and composing effect on his teammates. These traits have gone a long way in helping the Stars have success, according to Laxdal. "Mike brings a calmness to our group. If you watch the TV timeouts during the periods, he comes back to the bench and is just so relaxed. I think our team has taken on his personality. We don’t get flustered; we don’t get rattled if we’re down a goal, we just continue to play." McKenna, for his part, is only doing what comes naturally to him. "I’m just trying to be myself and have fun," he says. "Being too uptight in this stuff is going to hold you back. It really is the best time of the year. You can have so much fun doing this and you can gain so much in your career and experience with it. Just trying to keep the guys on the same wavelength in having a good time out there, and making sure that we’re dilligent so that we can have a good time." In the IceHogs, the Stars will face their stiffest postseason challenge yet. Though they did just enough to punch a playoff ticket, Rockford was one of the hottest teams at the end of the regular season with a 7-3-0-0 record in their final ten games. They rode that momentum to a perfect 7-0 record in the first two rounds of the postseason, dispatching the higher seeded Chicago Wolves and Manitoba Moose behind hot goaltending and unsustainably great special teams. Laxdal knows his team will have their hands full. "[The IceHogs] play fast, they pressure, they’re a lot like Tucson. So I think it’s going to be an outstanding series. I’m guessing it’s going to go six or seven games. Rockford hasn’t been defeated in the playoffs yet, and we’re looking forward to the first game. I think they got six players down from Chicago so they have a lot of NHL talent on the team. It’s going to be a great challenge for our group." Rookie goaltender Collin Delia is as good as anyone right now with a sparkling .948 SP in the playoffs. "It’s going to be a goaltending battle. And hopefully Mike’s experience will put him over the top of the young kid." Rockford's postseason special teams numbers are staggering. Most notably, they have 15 power play goals in the first two rounds. "Their numbers are outstanding. I think they’re 38% on the power play. Glendening and Franson -- I think they’ve got five or six goals on the power play from the back end. We have to stay out of the box and we have to play a tight game." For good measure, Rockford's penalty kill unit is clicking at 92.9% in the playoffs, good for second in the league. Everything is working for them right now. One topic that has come up more often than not during media scrums this season has been the amount of overtime games the Stars have played. The tally has run up to 33, including postseason games. The Stars believe their comfort level with extended play and depth gives them an edge. We’re not the most talented team in the league, we’re not the fastest team in the league, but we find a way. [We have] depth and resiliency. At any given time guys can score on our team. It’s a thing we’ve done all year -- we’ve been resilient. You never know who’s going to step up at any given time or whose gonna make that big play. Our bottom six forwards have been outstanding all year, and [our veterans] seem to rise when they’re most counted on." "We feel pretty comfortable in [overtime] and I think our record shows that," said Flynn. "Our fourth line has scored two of those [game winners] for us. If those guys get out there they can make plays too. All the overtimes that played out through the season will help out." The Stars are looking forward to packing out the H-E-B Center at Cedar Park during the first two games. "Our fans have been phenomenal the whole [season]," said McKenna. "It’s just been getting better and better. All season long you look how full our building’s been and how loud its been. This H-E-B Center is a fun place to play, man. And it’s only going to get better." For all that the Stars have put in to get home ice the lower seeded IceHogs, Flynn knows that it can be taken from them rather quickly. "We start at home so we obviously wanna come out and get that first win and not give up our home ice advantage," he said. "That first home game is really important to get. If you lose that one then maybe some guys start gripping a little bit because you know you need to get that next one. We just gotta come out and have a good start and see if we can carry it through." Holding onto home ice advantage, for McKenna, means putting in the preparation. "I think it’s just really doing everything you can to do your homework on your opponent coming in and trying not to leave any stone unturned," he said. "I don’t think you can ever be too prepared for a specific opponent. We’ll do our homework on Rockford." The series schedule against the IceHogs can be found here. When asked about his belief in his team's destiny, McKenna was quick with an answer that merits deep reflection. "I believe in working hard and hoping you get what you deserve." That's the best that any of us can do. The series opens with Friday's game in Cedar Park. Here's your schedule for the Western Conference Finals featuring the Texas Stars and the Rockford IceHogs. The Stars have home ice against Rockford, so Game 1 comes at home next Friday. Rookies and veterans. Skaters and goalies. Everyone contributed tonight as the Texas Stars dusted off their second round opponent in overtime to advance to the Western Conference Finals for the third time in team history. Veteran Mike McKenna stopped 37 of 39 shots across three periods and change. The fourth line center Joel L'Esperance had the overtime winner and a dandy assist in the first period. "It was a hard fought series," noted Coach Laxdal. "It was a lot closer than 4-1." Mike McKenna added, "You look at the quality of the prospects and the veteran players who have won championship and been to finals. It's been a great fit and a lot of fun. We're only halfway there." The fourth line was the motor of the team tonight, putting Texas on the board and scoring the winner. "It's not just to see them succeed on a personal level. It's knowing that we've had all four lines contributing. We carried the play through all four lines, and they're every bit as important as one and two." L'Esperance got the scoring started with an NHL-level drive to the net, bursting around Ryan MacInnis to earn a shot. Colin Markison cleaned up the rebound into a yawning net. It was a strong start to the first period where Texas truly controlled the pace of the game throughout. The power play got Texas in trouble later on in the frame. The Stars had a chance at a 5-on-4 power play but Sheldon Dries took a retaliatory penalty and Texas saw things go to 4-on-4. With Matt Mangene taking a tripping minor, the Stars were at the always awkward 4-on-3 disadvantage. Lawson Crouse was unmarked at the net and roofed one backhand over McKenna for the tie score. Tucson came out strong in the second period, outshooting Texas 7-1 in the early going. Late in the frame, the Stars got a power play of their own and cashed in. Travis Morin lofted one over Adin Hill from the right wing point to go up 2-1. Texas got another power play chance thirty seconds later and essentially had the chance for the kill shot. The Roadrunners broke in 3-on-2 shorthanded, and Ryan MacInnis redeemed himself with a shorty to tie the game at two. The teams went to the locker room tied at forty. After a scoreless third, overtime loomed once again. The start of OT was fast and furious. The two clubs played the first 6:39 of the frame without a whistle. Texas got in trouble as Dillon Heatherington and Brent Regner got hemmed into the zone for a lengthy portion of those six plus minutes. The Stars made it out alive, and the fourth line stepped up. L'Esperance picks up the story, "Laberge and Markison were doing a good job on the forecheck and we got some good zone time. Bayreuther had a nice shot from the point, nice and low for a rebound. It popped right to me and I swiped it in." Texas won four straight in the series after losing Game 1. The Stars have home ice advantage against Rockford and will start at home next Friday. Being completely honest, at the start of the series if you had told most there was a chance for the series to be over after five games, not many would have picked the Stars to be the advancing team. However, thanks to incredible goaltending from Mike McKenna and offense that is clicking just right, Texas has that chance tonight. You want your best players to show up in big situations, and the Stars got that on Wednesday. Mike McKenna pitched his second shutout of the post season. The Stars had, as a team, two shutouts in the entire regular season. Now McKenna has two (and a 44 save relief effort) in eight playoff games. Further, the Stars power play activated with Curtis McKenzie scoring his 2nd of the postseason. Both of McKenzie's goals this playoffs have been game winners. And in case you hadn't noticed, Brian Flynn is pacing the entire league right now with ten points in eight games (6 goals, 4 assists). Texas has tightened up its penalty kill in the postseason as well. With 3 goals allowed on 23 chances, they are the second best team on the PK among those still left standing. Only Rockford bests them (20/22). It goes without saying that it's desperation time for the Roadrunners. Some of their best players have been silenced. Dylan Strome, who had eight points against San Jose, doesn't have a point in the series and is minus-7. The fact that he still leads the scoring table for the Roadrunners says a lot about where they are in terms of team scoring. They're averaging fewer than two goals per game after averaging four per game in round one. The Stars have three bites at this apple. Tucson has to play flawless hockey from here on out. Texas would love to avoid the trip to Tucson and close things out tonight, winning their first division championship since they went all the way in 2014. 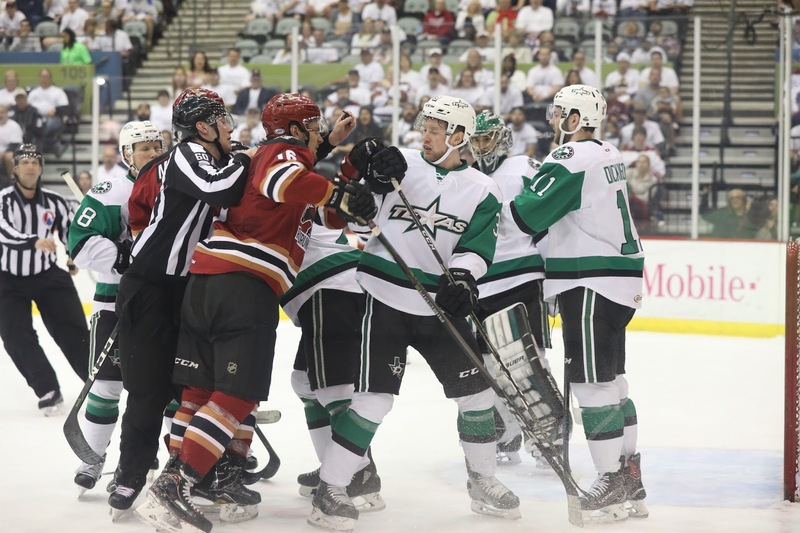 The Texas Stars won a tight checking, low scoring affair 2-0 over the Tucson Roadrunners on Wednesday night, giving them a commanding 3-1 series lead over their Pacific division rivals. They head into Friday’s home game with a chance to advance to the third round of the postseason. Goaltender Mike McKenna returned to form in an impressive 27 save shutout, his third of the postseason if you include his relief work in game three against Ontario. Brian Flynn’s two assists pushed him to ten postseason points, the first player to reach that marker in these playoffs. “You get some breaks, you make a good play and the guy scores,” said Flynn about his personal postseason success. Andrew Bodnarchuk tallied his first point of the postseason. The ten year veteran blue liner pinched down on the rush with 4:35 left in the second period to clean up Denis Gurianov’s rebounded shot attempt, giving the Stars a bit of breathing room with a two goal lead. Roadrunner winger Michael Bunting, who had both goals in Tucson's game one victory, put a scare in the Stars in the early going when he took a great pass up the middle and was left all alone on the rush less than two minutes into the game. McKenna stoned him on the play and was great in the first period when the Roadrunners were creating chaos with their forecheck. For Laxdal, the script was flipped from Monday’s game. He said that Tucson made their push in the first period. “I thought their push was in the first tonight and I thought we settled in. Mike was a brick wall in net.” The Stars ended up outshooting the Roadrunners 10-5 in the first period. They also managed to dust off their power play tonight with a goal from Curtis McKenzie. Flynn and Justing Dowling set the Stars captain for a one timer from the slot twelve minutes into the middle frame to open the scoring. Up to that point, the Stars were a perfect 4-0 in the playoffs when scoring first. After misfiring on the same play during Monday’s game, Flynn was happy to get another crack at it. 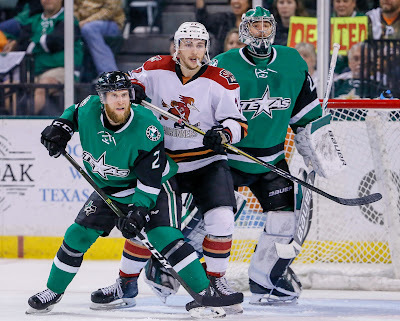 The Texas Stars are a poised, confident bunch heading into the game four of the second round of the playoffs against the Tucson Roadrunners on Wednesday night. They have a right to be after they benefitted from key contributions throughout the lineup during Monday's overtime win to give them a one game lead. Though Mike McKenna didn't have his best showing (33 saves on 37 shots), head coach Derek Laxdal expects both he and Tucson goaltender Adin Hill to bounce back in what he predicts to be a tighter game during Wednesday's tilt. In other words, the nine goals scored on Monday will be the exception, not the rule, going forward. That depends on whether or not the top nine for the Stars have anything to say about it. Jason Dickinson, Brian Flynn, Roope Hintz, and Remi Elie all chipped in on Monday with two points a piece. Dickinson was especially pleased, considering he had yet to notch a goal in the postseason. He weighed in after the game. "It’s nice. It’s been frustrating. I want to contribute as much as I can so it was nice to get a couple points. If you get to the net, usually good things happen. That’s what I’m trying to do and I was rewarded. So I’m going to keep trying it." Helping Dickinson get to the net are his line mates Remi Elie and the suddenly famous Sheldon Dries after his overtime game winner on Monday. Dries is warranting some well earned praise in the hockey community as of late, but this is par for the course for what he's been about all season. When placed on such a skilled line, he's really getting to show what he can do. Laxdal lauded the trio as the team's best line during Monday's win. Dickinson expects a harder forecheck from the Roadrunners and a sense of desperation on Wednesday. They’re gonna come out hard. We gotta match it. We can’t think about the lead. We can’t think about maybe stepping into a 3-1 lead. We just have to worry about [Wednesday] because that’s all that matters." 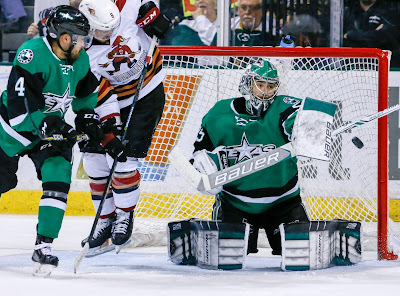 The Texas Stars won a 5-4 overtime thriller against the Tucson Roadrunners on Monday night, netting them a 2-1 series lead with Wednesday night's matchup looming. Roope Hintz, Jason Dickinson, Brian Flynn, and Remi Elie all pitched in with two points a piece. The unlikely hero Sheldon Dries had the game winning goal. "He’s got the ability to score in tight like he did in overtime tonight," said coach Derek Laxdal after the game. "He’s been a good player for us. That line [with Dickinson and Elie] had a lot of looks for us tonight. They were matched up against Strome [in overtime] and give them the credit. They got the best of that shift and ended up scoring the OT winner." Production from top players like Dickinson and Hintz was especially key considering both players had yet to score a goal in the postseason. "If we're going to challenge to get some wins in the series, those guys have to be key contributors. They’re going to have to score and they scored tonight." The first period was littered with solid scoring chances from the Stars, though the shot total in the frame only added to nine. On the first few shifts, the Stars amassed three 2-on-1 rushes that each malfunctioned in some way. Among the group was Hintz and Denis Gurianov, who couldn't connect on the cross ice feed but would atone soon after. Dickinson spoke about the early chances. "It just seems like we connected [early in the game]. They want to come in and pressure hard and their D wanna pinch in. It’s not like we specifically targeted that, but we recognize when that happens and we get the puck to the middle and we beat them." To break open the scoring, Hintz notched his first goal of the postseason when he cleaned up Gurianov's shot dumped into Hill's crease near the eight minute marker. "We were only able to capitalize on one of [the rushes]," said Dickinson. "But I think it set a good precedent for us that if they wanna come and pinch that hard we can take it right past them." It was an almost identical play to the one that didn't quite click earlier in the period. Tucson winger Lawson Crouse nearly got the equalizer, but the posts were Mike McKenna's (33 saves on 37 shots) friends in the process as the second year pro hit the pipes twice. Within the last minute before first intermission, Colin Markison went 1-on-1 with Roadrunners captain after the Stars killed off a penalty and nearly batted in his own rebound. The Roadrunners, who seemed to have an answer for every goal, evened the scored on the first shift of the second period. Defenseman Dakota Mermis, who scored twice, joined the rush and got his backhand shot to go high corner while McKenna was heavily screened. "At the end of the day, their a good hockey club," said Laxdal. They’ve got great speed, great skill. And you see their D-men activate. I think they scored three goals tonight." The Stars would get it right back on the next shift with a tip-in goal from Jason Dickinson. Brent Regner and Remi Elie recorded the assists. Near the halfway point of the middle frame, Brian Flynn pushed the Stars lead to two and picked up his team leading sixth postseason goal by capitalizing on several Tucson gaffes. Two Roadrunners collided near center ice, Mermis was left alone to defend the entry but took a puck to the face, allowing Flynn to walk in an get a couple of quick chances on an easy score. John Nyberg assisted on the goal for his first career AHL point. To finish out the period, the Roadrunners temporarily set up camp in the Stars zone and were rewarded with a back door tap in from forward Carter Camper to bring Tucson back to within one with seven minutes left. "I thought we had a real good start to the game in the first and second period. And then kind of like last game, we knew Tucson was gonna push." Gavin Bayreuther fired back four minutes later when he followed up his own rebound with his backhand that the screened Hill couldn't track. The Roadrunners pressured early in the third period and picked up another proximate goal after four minutes. After McKenna made a big stop on Dyson Mayo, he couldn't fight through the screen on the next shift when Trevor Murphy pinched down and sniped home the centering feed from behind the net. "We looked pretty gassed in the third period. [Tucson] was like a shark. They could taste the blood in the water." With time winding down in regulation and the Roadrunners at their most aggressive, Mermis' second goal tied the game with less than four minutes left in the game on a soft wrister from the rush that McKenna would've liked to have back. The Stars turned in a huge penalty kill at the end of regulation and the beginning of overtime. Riding that momentum, they turned it into the game winner thirteen and a half minutes into the frame with Dries being in the right place at the right time. "It was a weird bounce that got Hill out of position and then [Dickinson] had a good flush that forced that D man to make a pressured pass and I just happened to be there," said Dries. "I tried to get a quick shot off and beat Hill." Overall, Laxdal like what he saw from his team. "I really like our game in the first two periods. I just thought we tightened up [in the third] -- that’s something we’ll talk about. It’s playoffs, ya know? So for us, it's just put this game in the books and get ready for Wedneday night." The AHL Board of Governors has made it official -- the Texas Stars move to the Central division next year along with the San Antonio Rampage. Since the 2015-16 season, the Stars have had to play a full 76 game schedule in the Pacific division, competing with West Coast teams that play a 68 game schedule. Not having to play the full 76 game slate means longer periods of rest between games and wins being more valuable in the standings. With teams in the Central all playing 76 games, the Stars will not have to deal with the scheduling disparity anymore. To make room for the two Texas teams in the Central division, the Cleveland Monsters are headed to the Eastern conference. The official press release from the team website is below. 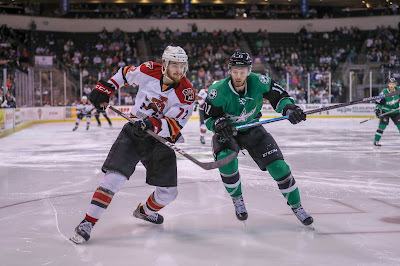 The Pacific division road to the Calder Cup is now routed through central Texas for the moment as the Stars take their tied series against the Tucson Roadrunners back to Cedar Park on Monday evening. There are two potential ways to view the Stars' win in Tucson last Friday. One approach is to see it as a gritty, gutsy victory over an extremely talented opponent. The more cynical perspective would suggest that the Stars deserved a lesser fate, having failed to score during two instances of 5-on-3 play while getting another all-world performance from their goaltender. Whether they stole the game or not, the wins all count the same in the playoffs. There is a reason the Roadrunners ran away with the division early in the season. Speaking of goaltending, Mike McKenna leads all playoff net minders with an exceptional .957 SP. The Stars will need to uncork their offense during this home stretch unless McKenna can maintain this level of play. 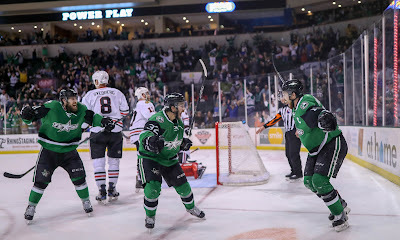 One major bright spot on that front was Curtis McKenzie his first playoff goal on Friday from his favorite spot. McKenzie said before the postseason that he wanted to get to the net, and he was finally rewarded by doing so. As they managed to on Friday, the Stars will need to stay away from stick fouls and avoidable penalties. If the Roadrunners are going to gift wrap ample power play opportunities for the Stars on Monday, they simply need to generate more good looks. Brian Flynn, who leads the team in playoff scoring (6 pts) but is curiously a -6, has two power play goals. Look for some of the top forwards to step up on the man advantage. Defenseman John Nyberg played a mistake free game in his AHL debut on the blue line during Friday's tilt and figures to stay in the lineup on Monday. 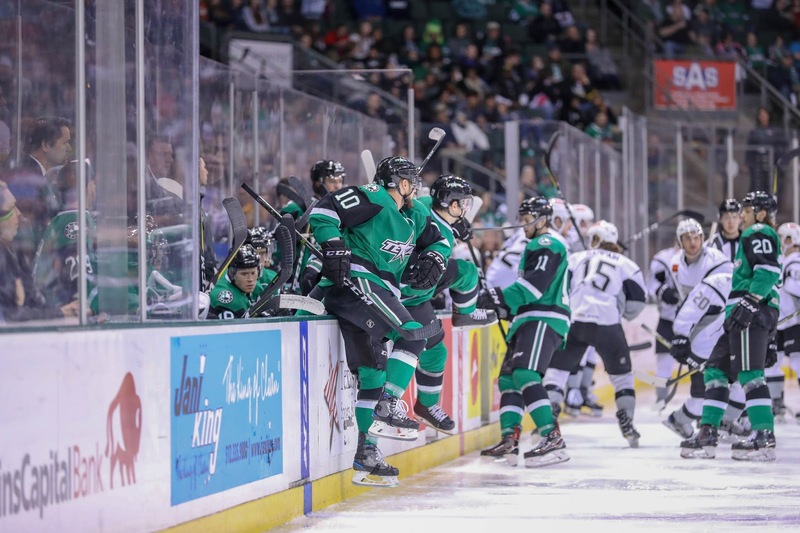 The Stars also added potential reinforcements in forward Jason Robertson and goaltender Philippe Desrosiers, recently recalled from the Idaho Steelheads.